Segmented turning is the result of a combination of various techniques, and there are several methods for building or constructing an item to be finished by turning. A few basic steps are needed to produce simple designs, and multiple steps and techniques are needed for more complex projects. Segmented work requires great mechanical skills, precision, and the occasional creative adoption or construction of special tools and equipment. The next section provides a general introduction into the art of decorative woodturning. Following below, selected woodturning projects are introduced, ranging from simple to more complex designs. The projects cover segmented woodturnings using wood as the only material, but also mixed-materials designs that incorporate semi-precious stones and minerals, synthetic materials, and jewelry-grade metals. Each project description includes information on materials, step-by-step instruction with actual photographs, and is intended to demonstrate particular designs and techniques. Feel free to mix or replace materials, and apply the techniques to your own designs. A selection of useful resources is included in the following sections. Part 1. Introduction to Segmented Woodturning. The basics of segmented woodturning are introduced in Part 1 of this Series. This section includes a description of the basic terms and calculations, an introduction to common domestic and exotic hardwoods with properties and availability, and a description of synthetic materials. Properties and usages for adhesives and glues are discussed, and some guidance for the finishing steps are provided. The introduction also includes information on tools and equipment, and useful accessories. Finally, a chapter on tool safety, and recommended personal protection is included as well. It is highly recommended to review the content of this introduction before starting with a segmented turning project. Familiarize yourself with the safety requirements for tools and equipment, and consider personal protection for respiratory safety and ventilation in your work area. Part 2. Building & Turning A Segmented Wooden Bowl. Armed with the contents of the Introduction you now should be able to understand the basic terminology of segmented wood turning. The resources provided in Part 1 will allow you to select your materials, perform the necessary calculations, and select the tools and equipment needed. Starting with Part 2 of this Series, a selection of decorative woodturning projects, ranging from simple to more complex designs will be introduced. 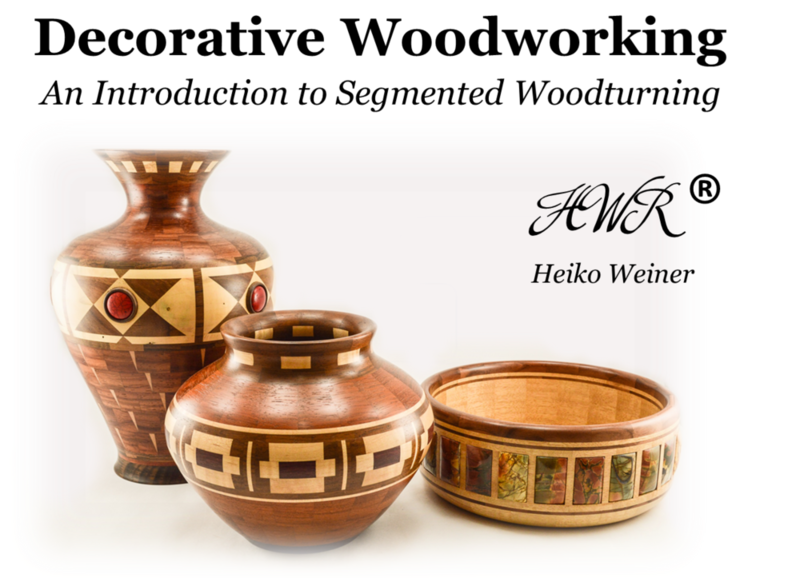 The projects cover segmented woodturnings using wood only, but later on also mixed-materials designs that incorporate semi-precious stones and minerals, synthetic materials, and jewelry-grade metals. The first segmented project described here is for a small wooded bowl using two different types of wood. The basic steps for calculating the materials needed and cutting the segments are introduced. Step-by-step instructions for assembly, and the finishing process are included. Part 3. Stepping Up Your Game: A Contemporary Design. The next segmented project described here is for a medium-size, approximately 8” diameter, wooden bowl that uses three different types of wood. Building on the layout of the previous project, pre-laminated boards are also used to obtain two different sets of segments. Some additional design elements are introduced. All cuts are still straight, and at 90 degree angles for the center design. The two laminated boards are composed to obtain two different sets of patterns with three, and five layers, respectively. The main pattern is constructed by combining two sets of segments with different lengths. 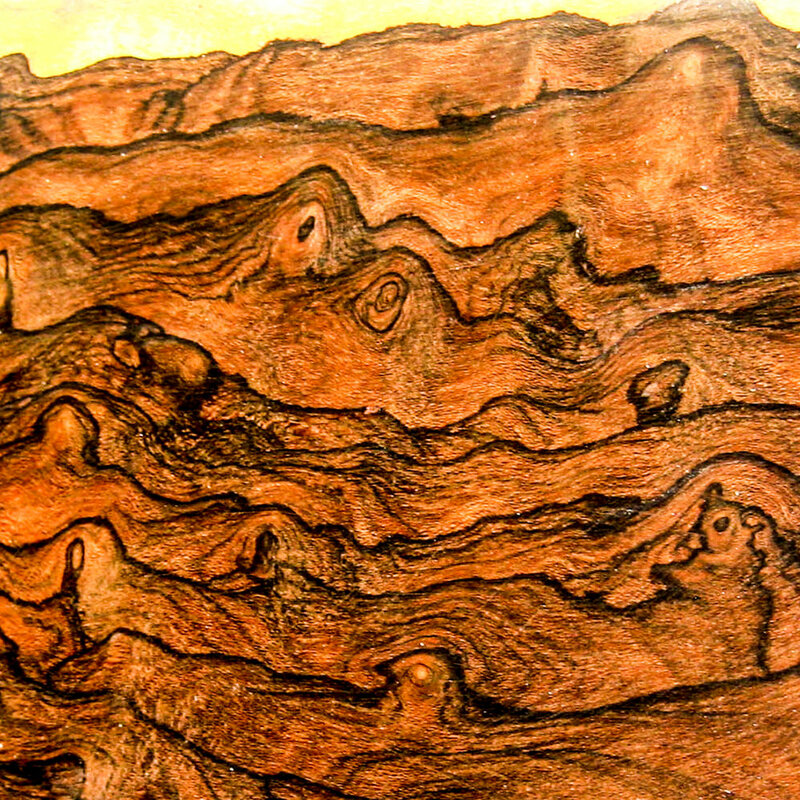 In addition, the use of veneer to separate patterns is introduced. The basic steps for calculating the materials needed and cutting the segments are also included in the manual. Step-by-step instructions for assembly, and the finishing process are discussed. There are a lot of interesting, and fun facts about trees: which one is the tallest one, the one containing the most amount of wood, the rarest one, the hardest wood known, and the oldest living tree of today… This chapter summarizes some of theses facts for the interested reader. … brought to you, and collected from my very own Dictionary of Useless Information. Properties of Common Domestic & Exotic Hardwoods. A summary of domestic and exotic hardwoods with properties, common usages, availability, and expected costs is provided in the following Section. Please note that price and availability listed there will depend on the quality, quantity, drying stage etc., and can vary significantly. For some domestic species, it may be useful to visit a local sawmill. For exotic woods, consider buying bulk, and try to get whole sale pricing; weigh the cost of shipping vs. a visit to the outlet. The woods are organized alphabetically, and within their respective families. Price ranges provided here are based on averages that were obtained from several sources, and refer to 4/4 and 8/4 lumber if not stated otherwise.